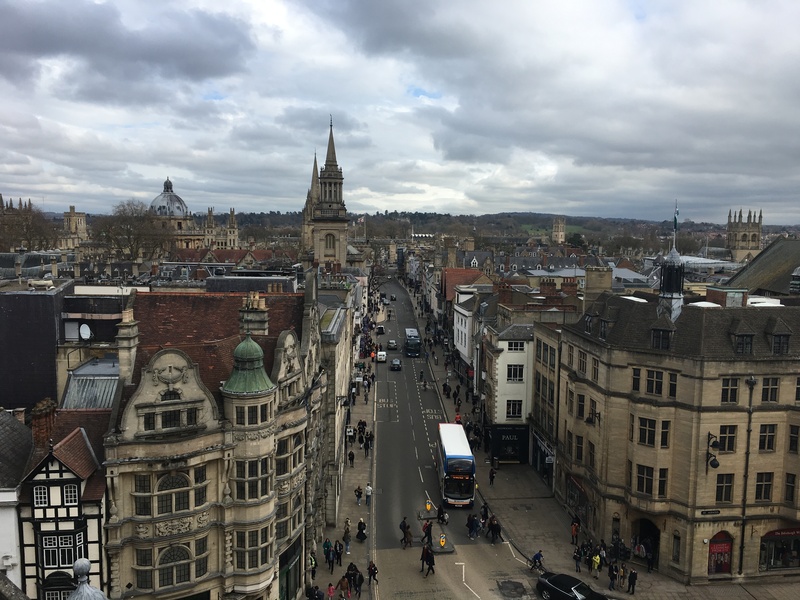 I’ve been fortunate enough to have quite a few friends and family members visit me in Oxford throughout my year abroad here, meaning that I’ve developed a bit of a “tour” of Oxford that I like to take them on. 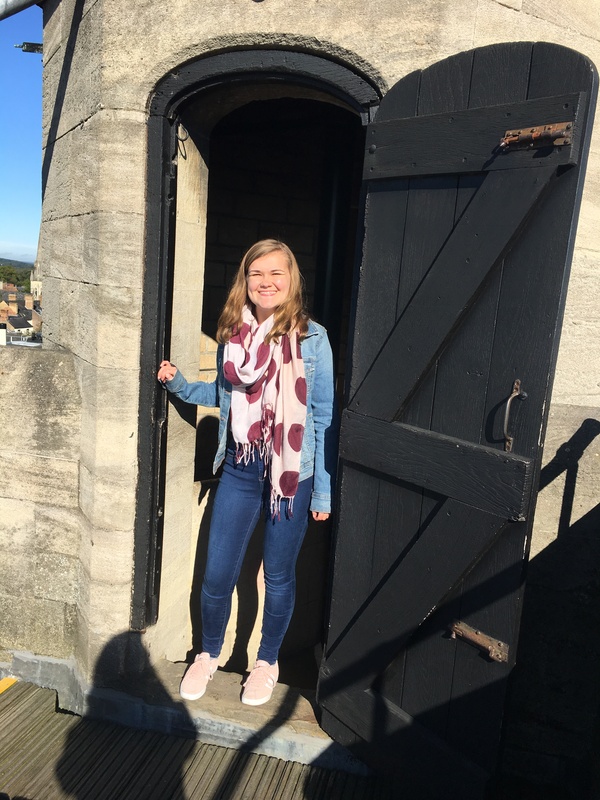 One of my favorite stops on this mini tour is Carfax Tower, which my dad and I discovered when we first arrived in Oxford. Not many people seem to talk about it, but I think it’s one of the fun hidden gems in town! Carfax Tower (also known as St. Martin’s Tower) is located at the intersection of St. Aldate’s, Cornmarket Street, Queen Street, and High Street in Oxford. Standing 74 feet tall, the top of this tower offers an amazing view of the surrounding city, especially on days when the sky is clear. The tower was built in the twelfth century as a church, but now it is mainly a tourist attraction that you can pay a few pounds to climb up. The steps up to the top of the tower spiral upwards in quite a narrow tunnel, but it doesn’t take more than a few minutes to walk all the way to the top and see the open sky once more. I love climbing up Carfax Tower for many reasons. Not only does it provide a remarkable view of the city streets below and the rolling hills surrounding the town, but it also lets you get away from the bustle of everyday life for a few minutes and take in a different perspective. It’s easy to get caught up in the daily grind of reading, researching, writing essays, going to lectures, and meeting with tutors during term. Sometimes it’s nice to remind yourself of where you actually are: this wonderful city with so much history, beauty, and places to explore. Me when I first climbed the tower. 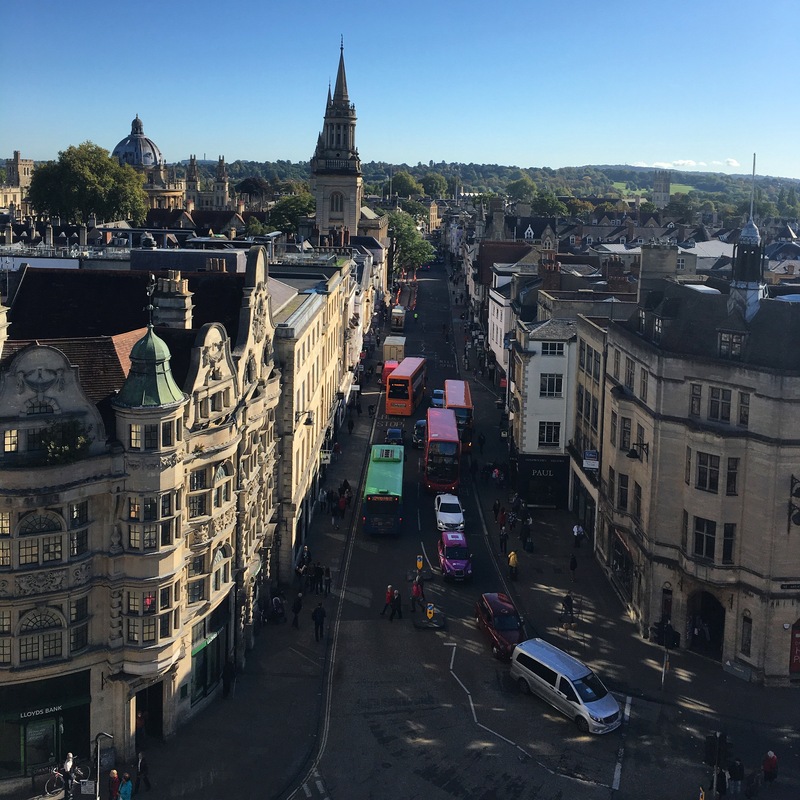 Have you ever climbed Carfax Tower? Do you like showing people around places you’ve lived or visited? Let me know in the comments section below! Have you visited Edinburgh yet? I hope you get the chance before the year is up, I think you’d love it! YES definitely come back to Oxford! Climb the tower! See the sights! ❤ It's such a fun and strangely peaceful tower to climb. Ohhh I definitely must climb this tower when I get a chance to go to Oxford again! Thank you for sharing! OMG thank you for this post. Seriously 🙂 , seriously I’ve worked in Oxford for the last 35 years and never been to the top of Carfax Tower.